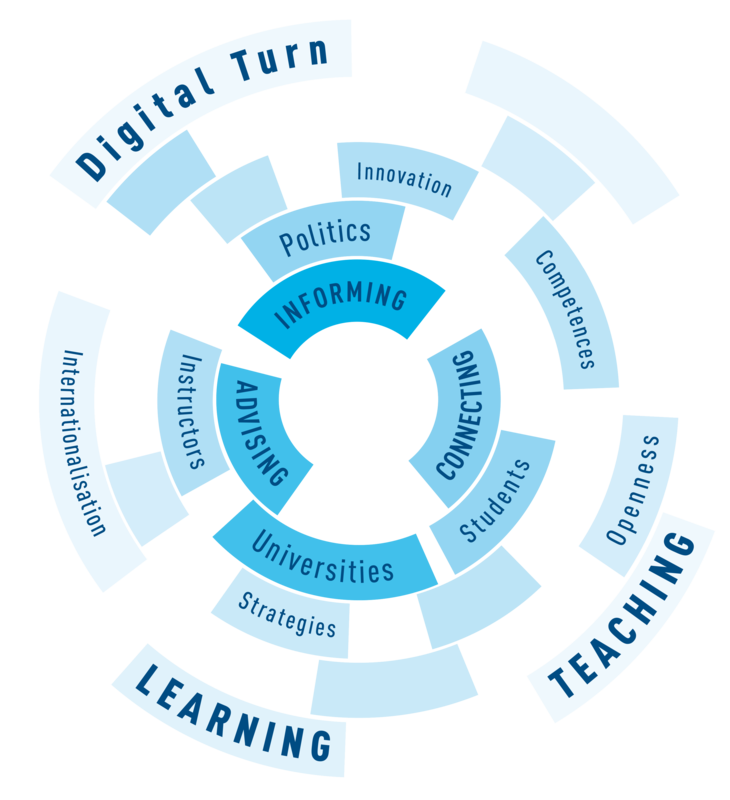 As an independent national platform, Hochschulforum Digitalisierung (HFD) provides a framework for discussing the wide-ranging impact of digitalisation on higher education institutions, and especially on higher education teaching. HFD supports Higher Education Institutions (HEIs) in making digitalisation an integral part of their institutional strategy and in incorporating it in their teaching activities. Together, HFD and HEIs develop forward-looking scenarios for higher education institutions in the digital world. Based on this collaboration, Hochschulforum issues recommendations to decision-makers in German higher education policy. Founded in 2014, HFD is a joint initiative by Stifterverband für die Deutsche Wissenschaft, CHE Centre for Higher Education and the German Rectors’ Conference (HRK). It is financed by Germany’s Federal Ministry of Education and Research (BMBF). Digitalisation cannot be considered in isolation from the existing basic challenges the German higher education system is facing. These include rising student enrolments and the corresponding increase in student diversity, the slow growth of international student mobility, and high student drop-out rates among bachelor’s students in some areas. The rising demand for highly qualified specialists and academic further education programmes will require new solutions with regard to the looming demographic changes. Digitalisation can help address these fundamental challenges confronting German higher education institutions. Rather than developing only a digitalisation strategy, therefore, HEIs should think of larger strategies for the digital age – strategies that emerge from an institution’s individual profile and are guided by its specific needs. HFD supports HEIs with developing and implementing their strategies by identifying emerging trends and by developing perspectives for the future. Teachers, too, need the competencies to actively shape digitalisation and to use it for their own teaching. But although there are pioneers who already make deliberate use of digital teaching and learning formats, for instance to enable students to pursue more individual and more flexible courses of study, most higher education teachers still do not take full advantage of these new opportunities. Using technology in teaching is not an end in itself. Rather, the emphasis is on using digital teaching and learning formats to create added educational and didactic values. Teachers must be empowered to recognise the added value of digital formats, and they must be supported in proactively employing these new opportunities in the classroom. Furthermore, higher education institutions or HEI consortia must establish or expand centralised support structures. The goal is to make digital teaching formats an integral part of teaching wherever they create added educational and didactic values. HFD supports higher education teachers and administrators with competence building in this area and helps promote the widespread use of digital media in higher education classrooms by developing scalable professional development modules. The range of issues addressed by HFD evolves dynamically. As a key agenda setter, we focus on flexible processes to help shape the discourse and the successful implementation of digitalisation in higher education teaching in Germany. Current issues are addressed by ad hoc working groups, formed for one year to explore concrete questions and problems to develop new solutions and courses of action. The findings of the working groups are made available to the public through studies, guidelines and other publications.